An early evening casserole march on Sherbrooke. Tonight Council of Canadians staff joined Casseroles night and what was also the 122nd day of the student protests in Montreal. Energy campaigner Maryam Adrangi, health care campaigner Adrienne Silnicki, regional organizers Mark Calzavara (Ontario-Quebec), Harjap Grewal (Pacific) and Scott Harris (Prairies) and I marched with about 900 people through the streets of Montreal to protest the proposed tuition hikes and austerity measures Quebec and the rest of Canada are witnessing. 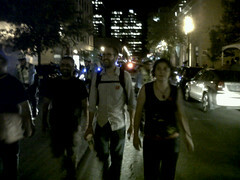 Atlantic organizer Angela Giles, water campaigner Meera Karunananthan, trade campaigner Stuart Trew and political director Brent Patterson were also in Montreal, and though they needed to depart prior to the larger evening protests, they did see some of the 'casserole' protests emerging out of the neighbourhoods. Based on draconian Loi 78, the march that we joined was declared illegal by police even before we left the park near UQAM. Police with batons lined some of the streets we walked by. 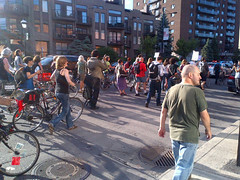 The march weaved through downtown Montreal twisting and turning corners to avoid police blockades. Grewal, Harris and Adrangi march in Montreal. What was heartening to see was all the people that came out to show solidarity to the students - there were older people, a mother with her three sons, a couple in their business clothes and many others from different walks of life. We came across people along the march who also showed solidarity - people on balconies flying red flags, staff from restaurants who came out banging pots and pans, dinner crowds waving from patios and people at an outdoor concert that we passed who gave us nods and encouraging smiles, some even had red squares pinned to their clothes. At a time when our governments are passing astoundingly undemocratic laws, such as Charest's Loi 78 and Harper's budget bill (which is expected to pass within the next day), this movement provides hope that the power still lies with the people. Truly an inspiring evening! Council of Canadians chairperson Maude Barlow is planning on participating in the massive protest being organized in Montreal for June 22.